From the Migration Period to the Early Middle Ages, knives much like the Havall Viking Seax Dagger proved helpful in both survival and combat. From cutting ropes to chopping wood, this blade was intended to be a blade that saw daily use. 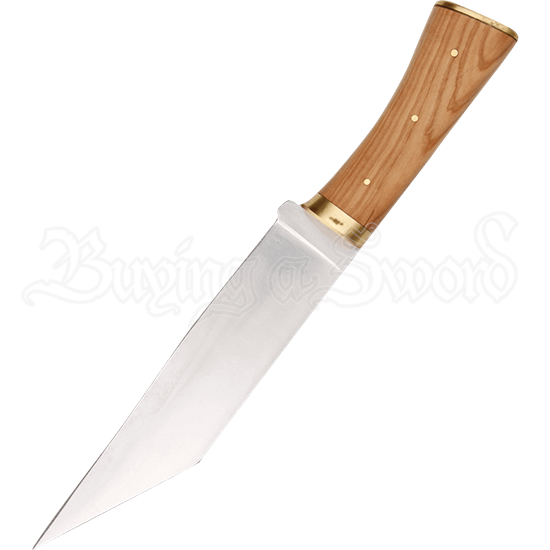 The knife possesses the broken-back blade of the classic Anglo-Saxon seax, with a broad shape that swiflty tapers to a thin point. The edge is rounded, making it a safe option to carry at local events. Brass pins secure the hardwood handle to the tang. Brass accents the pommel and guard as well. Whether for historical reenactment or live action roleplay, the Havall Viking Seax Dagger is a great way to showcase your survival skills.